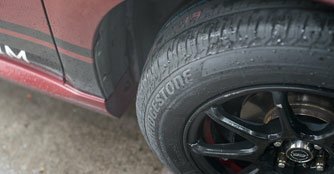 We find out why the Bridgestone Ecopia tyre is a highly regarded name in fuel-economical motoring and how the company has improved its recipe over the years. We've just returned from Adelaide, Australia, where we witnessed the world's largest solar car event, the Bridgestone World Solar Challenge. If you haven't heard of the Bridgestone World Solar Challenge, think of it as the World Rally Championship of solar-powered cars. More importantly, it's the World Rally Championship of solar-powered cars built by university and polytechnic students, most of whom are barely even old enough to drink. This means that most of the cars are built on limited budgets, but will have to endure 3,022km of harsh Australian Outback - from Darwin to the finishing point in Adelaide. 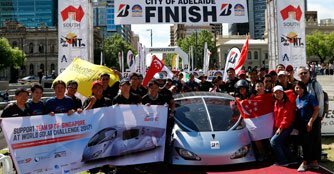 To help, Bridgestone has sponsored more than 10 teams in this year's 2017 World Solar Challenge with its advanced 'Ecopia with ologic' tyres and one of the teams is none other than the Singapore Polytechnic SunSPEC Solar Car Team. Singapore Polytechnic's solar vehicle project started six years ago as multi-disciplinary project between the School of Mechanical and Aeronautical Engineering and the School of Electrical and Electronics Engineering. Singapore Polytechnic is the first and only polytechnic to send out a car team to participate and race in the Bridgestone World Solar Challenge, and this project confirms Singapore Polytechnic as the leading IHL in applied engineering. Five vehicles have been designed, fabricated and installed in within the polytechnic's grounds since then. 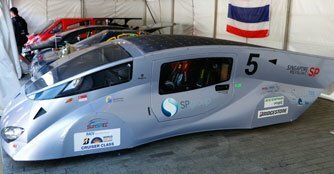 The solar cars its students have built to date are the SunSPEC 1, the SunSPEC 2, the SunSPEC 3, the SunSPEC 4 and the present SunSPEC 5. For 2017, Singapore Polytechnic has returned to the Bridgestone World Solar Challenge with a new Cruiser design, the SunSPEC 5, which is a total change as compared to the previous models. Simply put, the SunSPEC 5 has a redesigned solar array for better collector efficiency, commercial quality, adjustable seating, fully enclosed cabin for occupants, full dashboard, driver console and custom molded front headlamps. Of course, no matter how good the car is, the team wouldn't have been able to complete the challenge without the right tyres for the job. 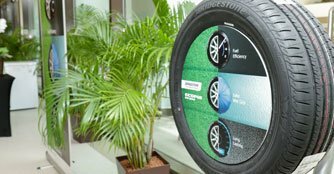 'Ecopia with ologic' is a highly fuel-efficient tyre for solar cars designed with Bridgestone's energy efficient tyre technology, 'ologic'. The large diameter of the tyre helps reduce tyre deformation and rolling resistance, while aerodynamic resistance is reduced due to its narrow tread width, which improves fuel efficiency of vehicles. More importantly, and especially crucial for the solar cars that take on the Australian Outback in the Bridgestone World Solar Challenge, 'Ecopia with ologic' provides high levels of grip on both wet and dry road surfaces by means of a long, grounding shape with an unique pattern and compound put together. 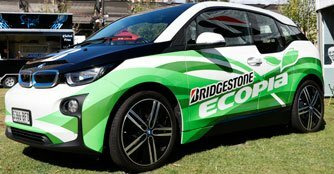 Just to give you a further idea of how accomplished the Bridgestone 'Ecopia with ologic' technology is, the Ecopia EP500 ologic is the standard supplied tyre for the BMW i3, a revolutionary electric vehicle developed by the BMW group that is on the forefront of eco motoring. Like Bridgestone's Potenza range, which is developed based on research from the company's involvement in Formula One racing, the Ecopia range is moulded after years of studying solar car endurance driving. The history of the Ecopia range dates back seven years to 2010, when Bridgestone launched the Ecopia EP100A and Ecopia EP100. With its research and development running deep in solar and electric cars, Bridgestone then released the Ecopia PZ-X in 2012, followed closely by the Ecopia EP200, the Ecopia EP150 and the Ecopia 850 in 2013. Most recently, the Japanese tyre manufacturer unveiled the Ecopia EP300 locally in June this year. Just like the Ecopia models before, the EP300 is positioned as an eco tyre that boasts low rolling resistance and superior wet grip performance, while boosting an extended wear life. Through the innovative design concept and engineering solutions adopted, the EP300 revolutionises and redefines the concept of an eco tyre. But compared to its predecessors, the Bridgestone Ecopia EP300, has been further designed and improved with three key objectives in mind - to have even safer and superior wet grip, to vastly improve a vehicle's fuel efficiency, and to be longer lasting than before. In that sense, it's a tyre that's made to be all-rounded - balanced across all aspects, and not just simply an eco tyre. The Ecopia EP300 features NanoPro-Tech compound, a high-dispersing silica compound that helps it achieve improved grip in the rain. At the same time, NanoPro-Tech compound aids in increasing the Ecopia EP300's contact area and reduces energy loss. In terms of being longer-lasting than the Ecopia EP200 it replaces, the Ecopia EP300 uses the Alenza tread pattern, which offers a deeper lug depth designed to improve durability and increase wear resistance. This new tread design also helps to better control tyre deformation, and these ultimately combine to afford drivers a longer-lasting tyre. More importantly, as an eco tyre, the Ecopia EP300 promises to increase mileage by 11km, tested on a car with a 70-litre fuel tank, over the outgoing Ecopia EP200. In terms of safety, namely wet braking distance, a test that was conducted at Bridgestone's Thailand proving ground also revealed that a car fitted with the Ecopia EP300 tyres managed to brake 1.27m shorter than the same vehicle with the Ecopia EP200 tyres from a speed of 80km/h. Its highly developed characteristics make the Bridgestone Ecopia EP300 the perfect tyre for cars like the Honda Accord, Honda Civic, Hyundai i30, Mazda3, Nissan Teana, Toyota Altis and Toyota Camry, just to name a couple. Should you own any of these cars, it's highly recommended to give the Bridgestone Ecopia EP300 a shot, especially if you drive often and over long distances. After all, is there any doubting the ability of the Bridgestone Ecopia range since it has already conquered 3,022km of the great Australian Outback? Plus, it is the tyre of choice for a premium electric vehicle like the BMW i3. For more information on tyre availability and retail selling price of the Bridgestone Ecopia EP300 for your car, please visit or contact any authorised Bridgestone dealer today.